This is a hearty dish of ultimate comfort food. It is not meant for those with a weak heart or vegan tendencies. Cut the smoked sausage in half, lengthwise, and then chop into 1/2 inch "half moon" cuts. Cook in a skillet until lightly browned. Meanwhile, place the cooked and diced potatoes in a 2 quart casserole. Add the cooked meat and gently mix. Mix all remaining ingredients (except for the shredded Jarlsberg and the paprika) in a saucepan over medium heat until warm, thickened and smooth. Stir constantly. Until your arm hurts. 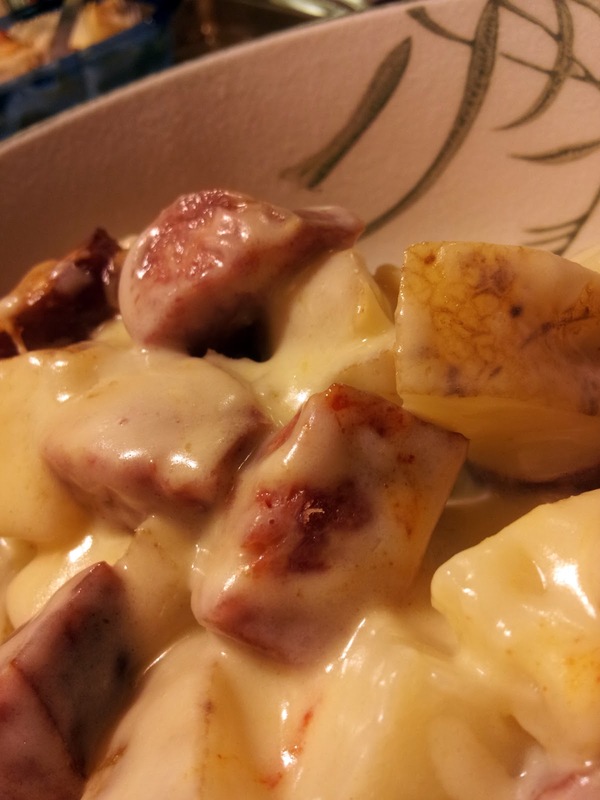 Pour the cheese sauce over the potatoes and meat. Sprinkle the shredded cheese on top, and then sprinkle the paprika evenly over the top. Bake in a preheated 350°F oven for 35-45 minutes, until the top is golden brown.